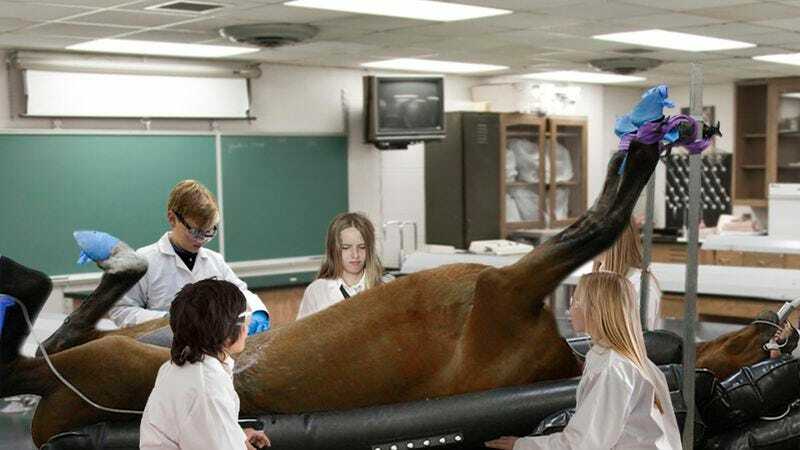 MONTCLAIR, NJ—Students at Glenville Middle School expressed disgust Thursday at having to dissect full-size horse cadavers, a much-dreaded annual assignment given to all seventh-grade biology classes in the local school district. “You always hear that [biology teacher] Mr. Becora’s going to make you dissect a 14-hand thoroughbred, but until you actually see one all pinned down on your lab table, you don’t realize how gross it’s going to be,” said Lauren Denison, 13, who has protested the policy stating that any student who refuses to participate is automatically given a C. “They give you this horse in a tank of formaldehyde, and it’s super disgusting—you and your lab partner have to slice off the hooves one by one, and that’s before you even crack open the rib cage and remove the aorta. Yuck!” As of press time, resident class clown Ian Levine was reportedly trying to lasso Denison using his horse’s small intestine.